We, the members of Saint Faith's Episcopal Church, recognize that we are disciples of Jesus Christ. As disciples, we are committed to providing a Christian environment for spiritual growth and to responding to the needs of our community. 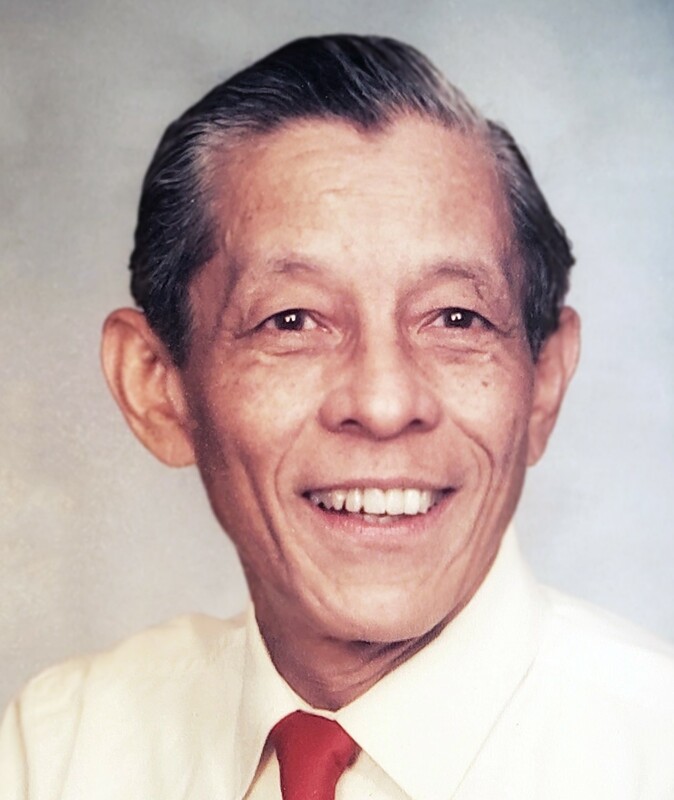 Monday February 11, 2019: Roy (Bobby) Chin passed away last night, following a long illness. Father Picou and Valrie Gayle had been to visit him that afternoon. Please keep Marion and the family in your prayers. The Funeral Services will be held at St. Faith's on Saturday, February 23rd at 10:30am. 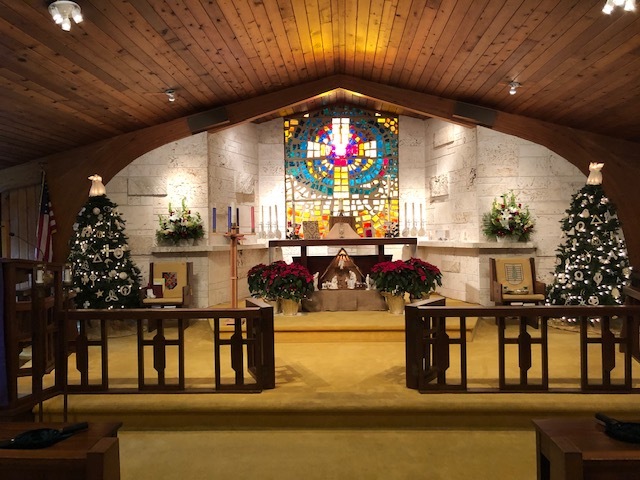 Thank you to the Altar Guild, ECW and others who worked hard to transform our santuary into a magical Christmas place once more. 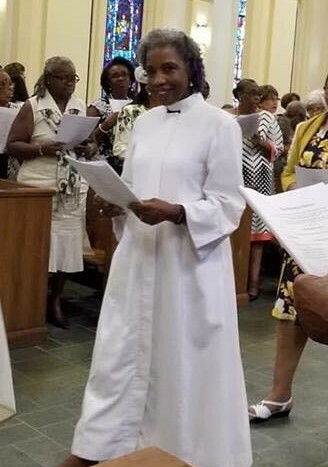 Congratulations to Reverend Marcea Paul, who was Ordained as an Episcopal Priest today at Trinity Cathedral. Marcea served St. 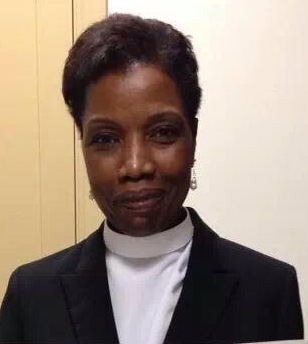 Faith as a Deacon for several years, then attended Virginia Seminary for 3 years. Many from St. Faith attended the ceremony to support her. 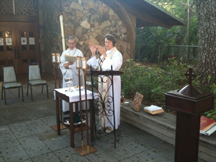 Reverend Paul presided at the Holy Eucharist for the first time at St. Faith's June 17, 2018. She then moved to Austin Texas, where she has been called to a Parish there. Palm Sunday, March 25th marks the 1st Day of Holy Week, St. Faith’s will observe the Procession of the Palms at our 9 a.m. service which will begin outside. The Palm Crosses will be blessed and then we will process with the palms, into the Church. Starting at 7:00 p.m. on Tuesday in Holy Week, a Service observing the Stations of the Cross will be held. On Maundy Thursday at 6:30 p.m., parishioners will share an AGAPE Meal. 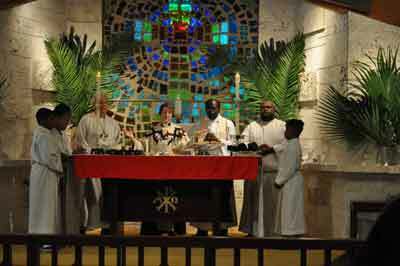 FOLLOWING THE MEAL ON MAUNDY THURSDAY everyone will go over to the Church for the Eucharist and Stripping of the Altar. On Good Friday, a Tenebrae Service will be held at 7:00 p.m. 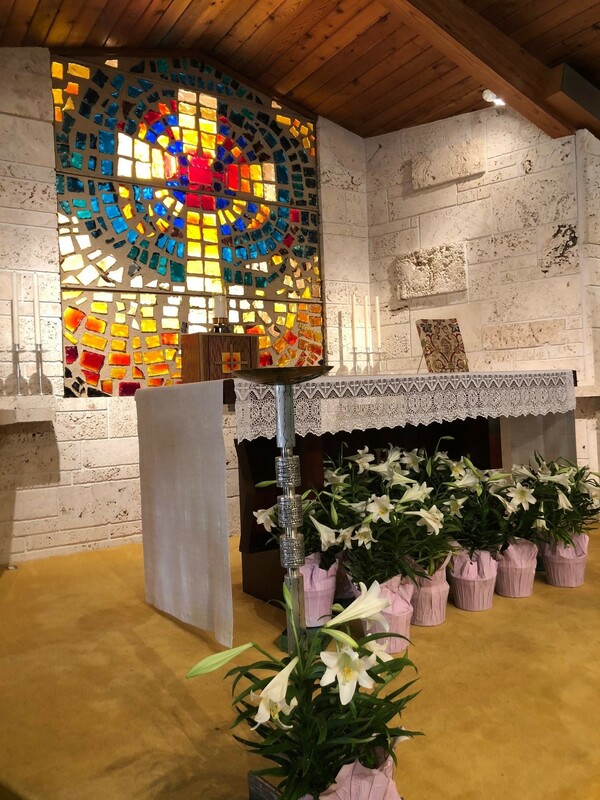 The Festive Easter Mass will begin outside at 9 a.m. with the lighting of the New Fire, from which the Paschal candle will be lit. Christmon Trees- they are up and beautiful as always... thank you to all who helped. • Congratulations to Donna Lewis who received the "Distinguished Woman of the Year Award" presented by the ECW delegates who attended the ECW Deanery meeting on Saturday, Nov 18th. 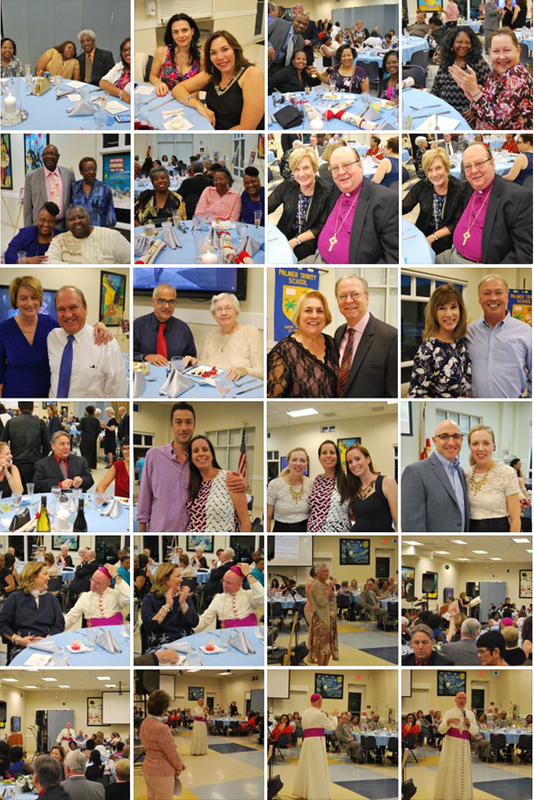 Thank you to Father Picou and all the ladies who made the South Dade Deanery Meeting a Success. St. Faith Community .... Your ongoing support of this important ministry has tangible results. Miguel de la Cruz & his daughter & son-in-law Maria & Noe Vargas have been coming to the St. Faith Food pantry for several years. 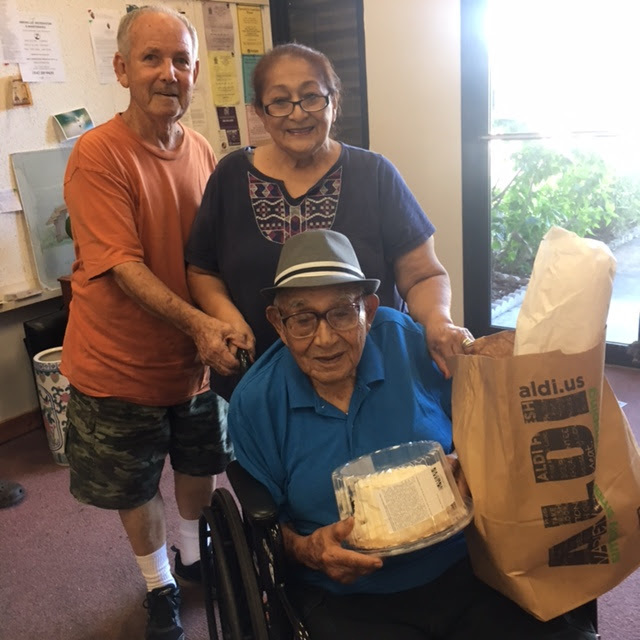 This past week he was celebrating his 100th birthday & we helped him celebrate with the gift of a birthday cake. Happy Birthday Miguel. Food Pantry distributed 570 bags in August, September and October. These went to approximately 179 households each month, impacting 580 people who live in those households. Eight homeless persons received food and toiletries as well as socks & towels. The pantry was impacted by Hurricane Irma as it had to close owing to the electrical outage at the Church. Food that was stored in the Freezers was lost and had to be replenished. 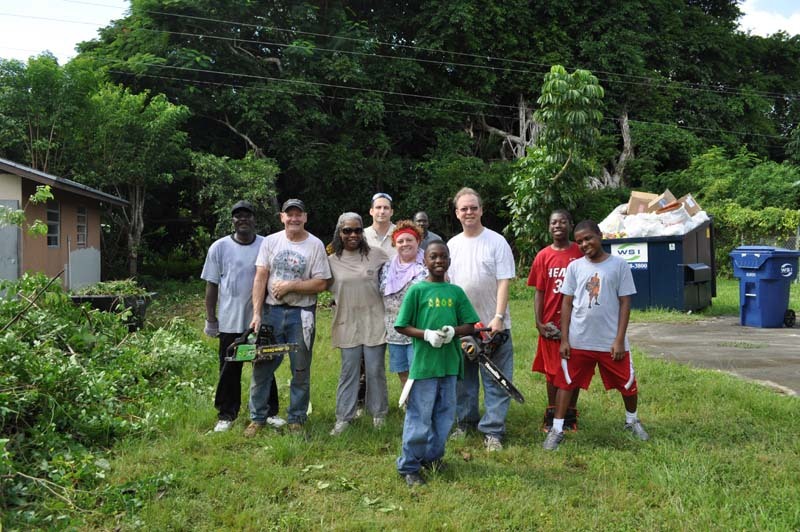 We thank Episcopal Charities for the additional grant to help with this. That grant also allowed us to help a some people who lost their clothes and bedding during the hurricane, as well as other people who were not clients but who came off the road to get food. We were glad we were able to do help them. Please note that a “Wish List” for the pantry has been posted on the notice board by the church doors. The Fall Stewardship Campaign at St. Faith’s was launched on October 22nd. This means that each of us who calls St. Faith’s his/her Church home, and everyone who loves St. Faith’s is being asked to give of his or her Time, Talent and Treasure. Although your Treasure is very important to the well-being (indeed its survival) of St. Faith’s, it’s not just your Treasure that is needed. Your time and talent are needed as well. Is there a ministry of the church you believe you can be of benefit to, or YOU CAN derive benefit from, then PLEASE, dive right in. Speak to a member of the Vestry or call the office. How would you like to be sick at home and have no one call to enquire about you, or visit with you? That’s a ministry that needs help! Can you make a call or visit someone? Supposed the Church was not set up for Service one Sunday because no one volunteered to be on the Altar Guild– could you do it? How about being a Eucharistic Minister or Serving at the Altar? The Priest needs help at both Sunday services – will you help? 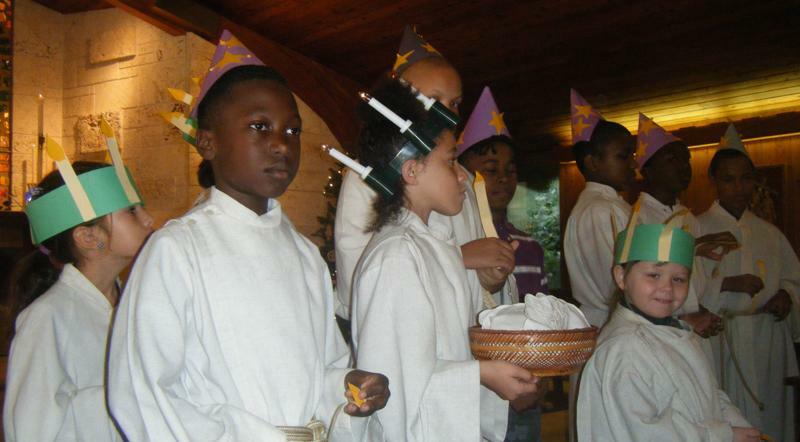 Other ministries include: Hospitality, Choir, Acolytes, Garden Committee, the Food Pantry and Communications. Your Time and Talent are especially needed at this time when our congregation has shrunk significantly, and all the tasks of the various ministries still have to be accomplished. PLEASE HELP! THANK YOU Scout Troops for your outstanding and much appreciated efforts at helping with cleanup at St. Faith Episcopal Church. Specifically: Cub Scout pack #357, Boy Scout troop #357 and Girl Scout troop #362. Special Thanks to St. Faith Parishioners and Mark and Brad Hadley along with Chris Bulgarian who coordinated the troops and other leaders including Layla Bulgarian, Kevin Whelan, Jim Bryan, Frank Rivera, Chris Amaya, and Carmela Seaz, Jeff Velez, Jason Couto and Victor Sakay. These folks worked very hard Sunday afternoon... and accomplished something just short of a miracle... there is still much more to do ... but this effort certainly made a huge dent in the mess. 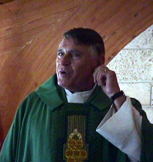 With deep sadness we announce the death of our beloved friend, pastor and parishioner Fr. Cyril White who passed away Wednesday August 2, 2017. Please keep his wife Christine and their family in your prayers. Sunday, March 5, 2017 , we welcomed a our new interim priest to St. Faith's Episcopal Church - Father Michael Picou. Father Michael has served at St. Stephen's in Coconut Grove since 2006 with a one year break at All Souls on Miami Beach in 2016. He was chaplain to Saint Stephen's Episcopal Day School from 2012 through 2014. He is also an R.N., having recently retired from the Miami VA Medical Center where he was a clinical research coordinator for studies ranging from infectious diseases to PTSD treatments. He was born in Louisiana and has called Miami his home for over 50 years. He arrived in Miami in 1966 and graduated from Miami Springs Senior High in 1967. He has undergraduate degrees in Philosophy and Nursing, as well as his Master of Divinity. Fr. 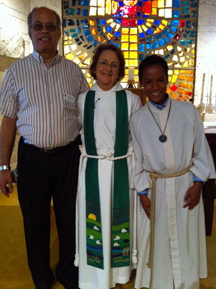 Michael also completed a year of Anglican Studies at the Episcopal Seminary at Sewanee in Tennessee. • Meditations for the Season of Lent “Ashes and the Pheonix”, are now available. Donation $5.00. The choir sung a wonderful tribute to her during the service and other photos were posted on our facebook page. The Ventua family are sad to announce that long time parishioner Hazel Ventura passed away at home on Wednesday April 26, 2017. We are sad to announce that that Agnes Alexander died yesterday June 8 from heart failure due to complications from the lung transplants. 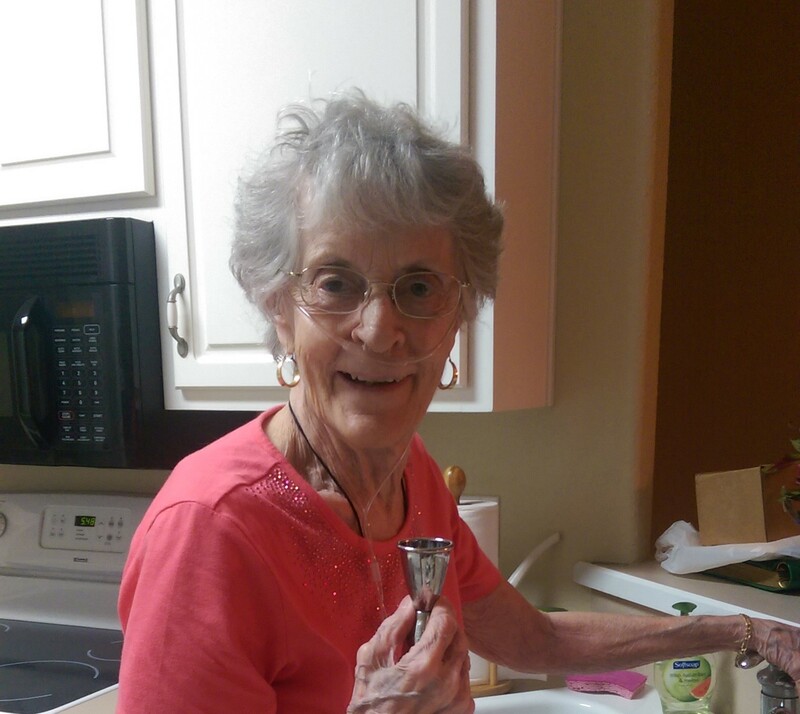 Agnes, who was a long time and supportive member of the St. Faith’s family was diagnosed over 10 years ago, with systemic scleroderma, which lead to permanent lung damage and pulmonary fibrosis/pulmonary hypertension. Her many friends and supporters, including her St. Faith’s family raised over $60,000 (from her original goal of $50,000). 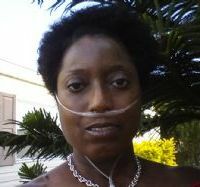 She had relocated North to prepare for the transplant, which was completed 6 months ago. Her wish was to be buried in the Virgin Islands so she will be taken there. Since she had a special connection with St. Faiths, they are also contemplating a memorial here. More information to follow. Just before sunset, clear sky, glassy pond, birds singing and flying around the area, perfect temperature,7:07 p.m. Saturday April 23, 2016 Barbara Seykora went to our Lord. It was peaceful and beautiful. 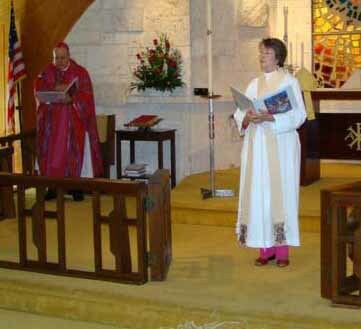 Barbara and her late husband Larry were long time parishioners, and supporters of St. Faith's. Although Barbara had moved away, she still stayed in touch with our church, loved receiving photos of the Altar on special occasions, and was often the first to respond when there was a need. Most recently when the stoves in the parish hall quit; and a crisis notice went out, she quickly responded by buying one of the two stoves.... she truly loved St. Faith's and we loved her. We will miss her. We will forward any further details of arrangements when they are known. It is with deep sadness that we report the death of Mike Anderson. 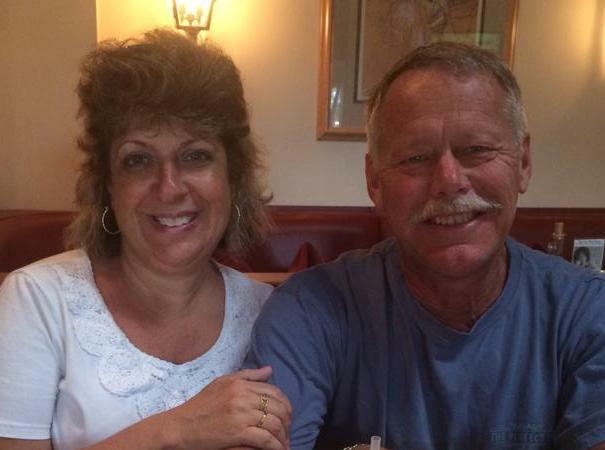 Mike died suddenly on Friday afternoon after a valiant battle with ALS. 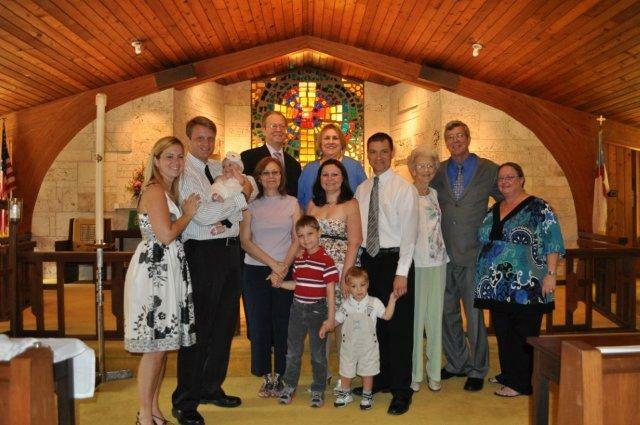 Mike and his family were pillars of St Faiths Episcopal Church for many, many years. One of his daughters, Paige Anderson and her daughter Avery still attend St. Faith’s. Mike and Susan were married at St. Faith in the mid 1980’s. 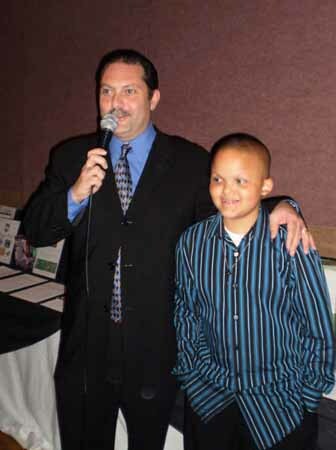 Mike was an active member and supporter. He served as Sr. Warden, he was one of the “Vestry member for life” club. Mike had many talents and was often found working on a weekend repair project at the church, always tending to what needed to be fixed. Mike built the St. Faith’s baptismal font, and the simple 6 ft. wooden cross that Mike made many years ago still hangs on the main administration building at the entrance to St. Faith’s, and is used every year for the Maundy Thursday services. God bless you Mike for all you have done. Mike and his family moved to Ocala around 2005. 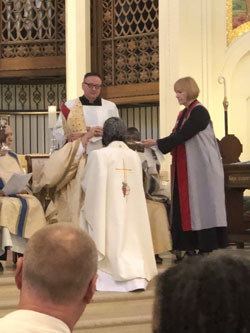 He and his family have been an active members of Grace Episcopal Church there, and he was ordained as a Deacon in 2012. St. Faith joins Grace Church with one voice now saying to him, "Mike, go in peace to love and serve the Lord. Alleluia, Alleluia." 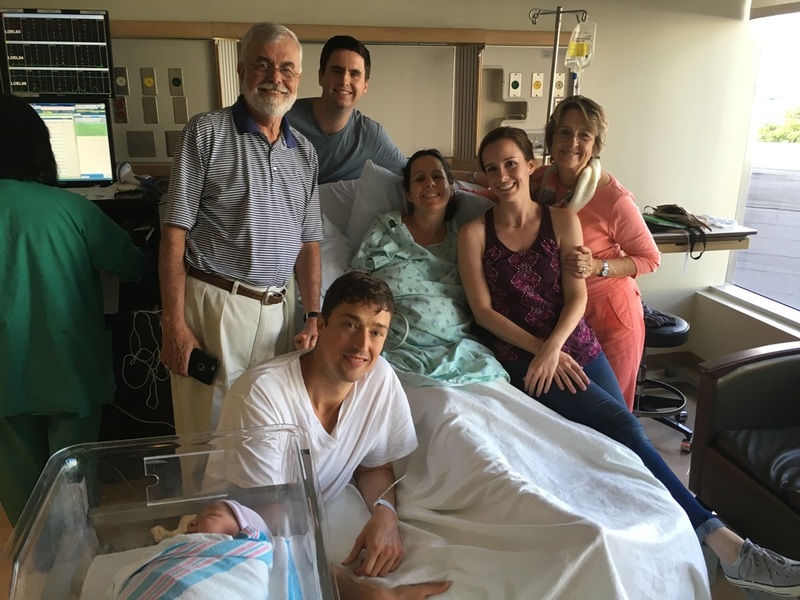 Jennie Lou & Ben Reid proudly announce the birth of their Grandson Asher Reid Ames - born November 12, 2015 11:20 A.M.
FUNERAL: The memorial service for Carol Ann Bertoli (May 10, 1943 – September 25, 2015) was held Saturday October 17. St. 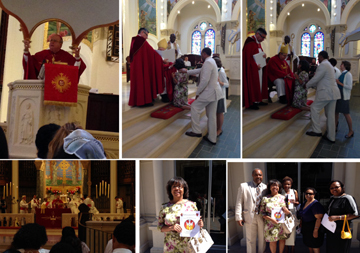 Faith's parishioner Yvette Lee was confirmed Feb 22, 2013 at the Diocesan Service of Confirmation, Reception & Reaffirmation. Great music from the Anglican Chorale (regional Episcopalian volunteers), beautifully restored building & happy people. Left to Rigth: Bishop Frade preaching / Bishop Frade lays hands on Yvette Lee to confirm her / Larry, Mother Reid & Eardie Davis stand behind her in support / Bishop Frade celebrates for Holy Communion. / Yvette Lee with her sponsors, aunt & cousin. Valentine’s Day was extra special for St. 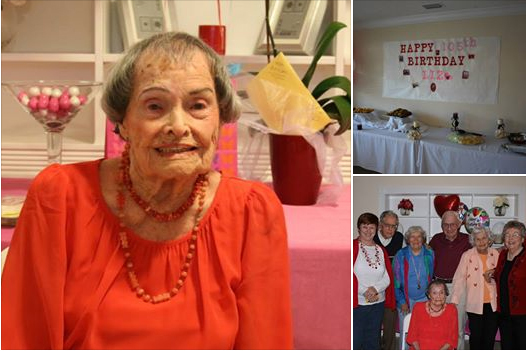 Faith Parishioner Liz White who celebrated her 105th birthday. Happy Birthday Liz!!! And we pray for your continued health and happiness! A Youth meeting is scheduled for Friday, February 28 at 7PM. All youth in Middle and High School, please plan to attend. Any adults who are interested in working with our youth are welcome to attend. Remember that the future of our church depends on our youth! A Lay Reader’s meeting and training is scheduled for Saturday, March 1 at 10AM. The session will be held in the church. All Lay Readers please plan to attend. Bishop Frade has designated today as Episcopal Charities Sunday, but we at St. Faith’s will hold our EC Sunday on May 4. Episcopal Charities supports ministries such as feeding the hungry, housing the homeless, tending to our seniors and offering after-school tutoring and a safe space for our children and teens. 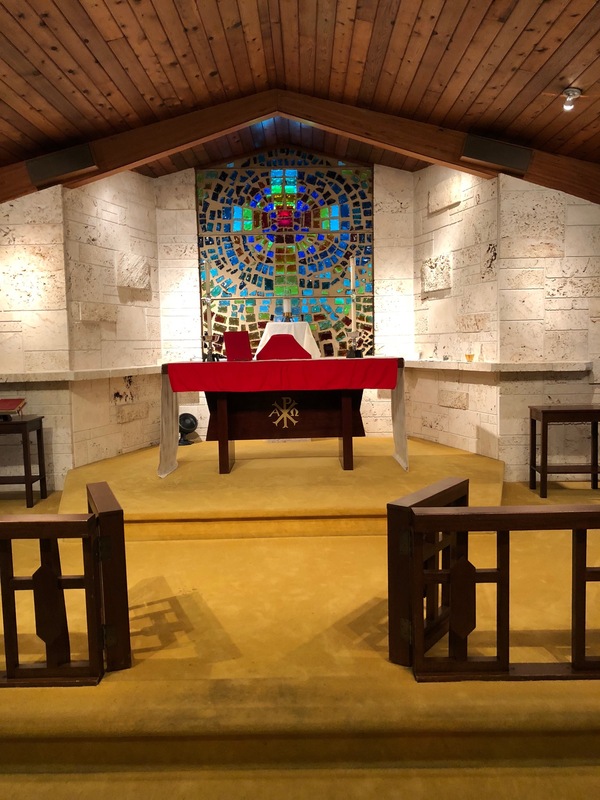 Please consider what you may be able to give to help Episcopal Charities as they continue their support of ministries from Key West to Jensen Beach. 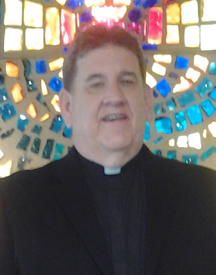 On Saturday, January 18, our own Father Tom Graf will be installed as Priest-in-Charge at the Episcopal Church of St. James the Fisherman at Mile Marker 87.5 in Islamorada. Please call or email St. Faith’s office if you would like to join in this celebration but need a ride. Of course we will join in prayer for Tom and Isabel as they embark on this new journey in ministry. January 25 All are invited to join Mother Reid and the Vestry on Saturday January 25 as they gather for an open conversation about the vitality of St. Faith’s and to set our common course for 2014. Please help us to prepare by sending the dates for your committee’s events to the office by tomorrow, January 20. The meeting will be held in Verell Hall and will begin at 8:30 A.M. with a continental breakfast. February 2. St. Faith’s Annual Souper Bowl Sunday is February 2. Don’t forget, Marcia Hitchins has promised to send up prayers for your Super Bowl team if you bring in a can or two of soup, ravioli, chili, etc. for the Food Pantry. FLOWERS Please remember to sign up on the Flower Chart at the back of the church to provide flowers in remembrance or in thanksgiving on a Sunday or two in 2014. Our Youth are planning a Talent Show at the end of February to raise funds for the June Bullock Scholarship Fund to help with fees for camp. Please stay tuned for more information as the plans unfold and flyers are distributed. If you would like to enter you may wish to brush up on your talent and audition for the show. Norman G Taylor passed away at his home in Melbourne Beach on December 8, 2013. Norman was a parishioner of St. Faith’s for 20 years until his retirement from AT&T in 1991. Norman was a lay reader; he served on the vestry and played some painful games on the baseball field. He was a devoted husband, father and friend. St. Faith’s was like a second home, so it is fitting that he will be coming home for a celebration of life service on February 15, 2014. 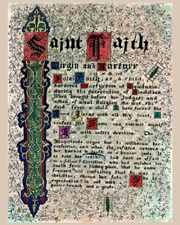 January 12 is the day for the Annual Meeting of St. Faith’s Parish. Annual Report HERE If you are the leader of a parish organization, please complete your annual report as soon as possible (at least right after Christmas). We will hold our meeting during breakfast between the 8:00 and 10:00 services. January 12 is also the day that we celebrate the Baptism of Our Lord Jesus Christ. 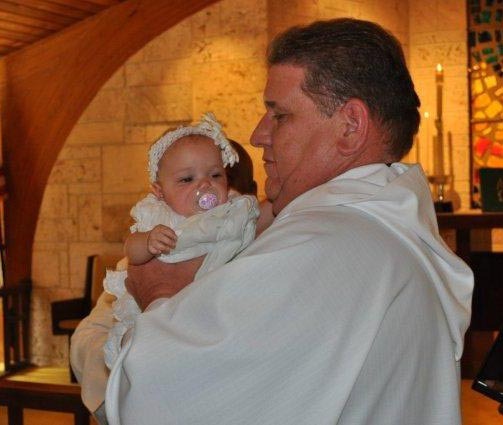 Sarah Ortiz, daughter of Raquel and sister of Anthony, will be baptized at the 10:00 service. If you or someone you know would like to be baptized or to renew Baptismal vows, please contact the office for a document to provide us with your information. 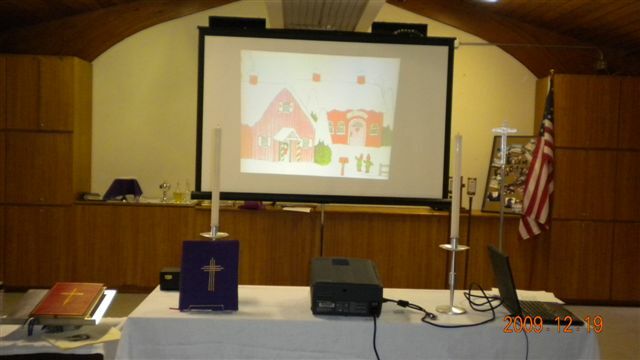 Thank you to the Altar Guild Members; Christine Piersol; Marcia Hitchens; Andrea Frye; Eileen Alvaranga; Marcea Paul. December 8 and 15th It's time for our Snowman Project of donating toys for children connected to the families enrolled in our Food Pantry. Reach into your generous spirit as you reach out to express God's love for all through these opportunities for giving. Pick your Snowman tag from the bulletin board outside the church, choose a gift for the child described on the tag, and have fun shopping to warm a heart. After wrapping your gift, attach the Snowman tag and bring your donation to the office or to church on December 8 and 15. Pray for the recipient of your gift throughout Advent and Christmas! August 25, 2013 Brad Hadley lead his Scout Troop as part of his Eagle Scout Project to create an outdoor chapel area. 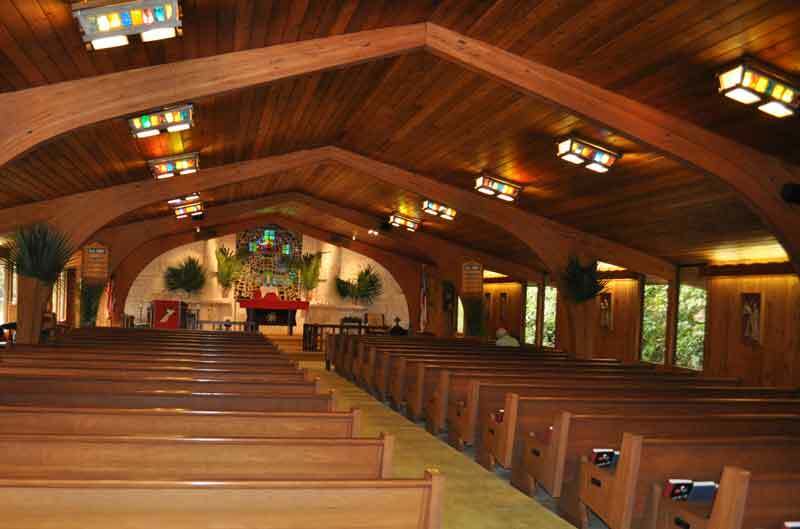 The chapel includes an Altar and benches located in a wonderful shaded area of our woods. What a tremendous effort!! 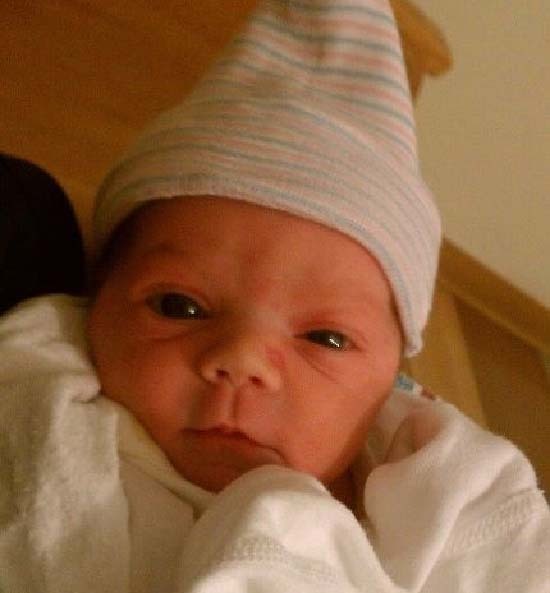 August 13, 2013 was a busy day for babies: Super happy grandparents: John and Maria Monteleone announce the birth of their first grandchild .... granddaugter - Jahn Cali Monteleone who was born August 13, 2013 at 5 lbs. 8 ounces. 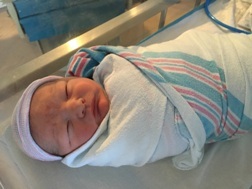 Parents are John Brady Monteleone and Leah Monteleone who live in California, Maryland. Congratulations also to Luz and Guillermo Perez-Iturbe, as they welcome daughter Maite who also came into the world on August 13. 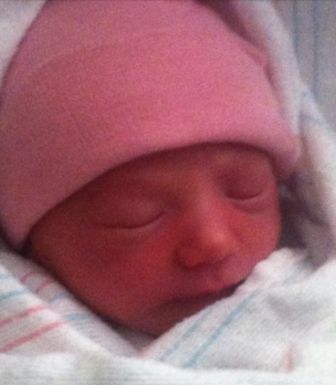 August 28, 2013: We are sad to announce the passing of Eliza Phillips Ruden. Eliza was an active member of St. Faith's for many, many years. 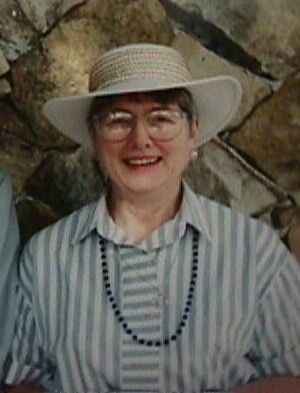 In recent years, she regularly attended the Wednesday East Ridge Service, but when she was able to attend services at the church, she normally came to the 8:00 service. Many of us remember her for her bright smile, kind heart; and she also always brought her own seat cushion, maybe for those 'long sermons'. 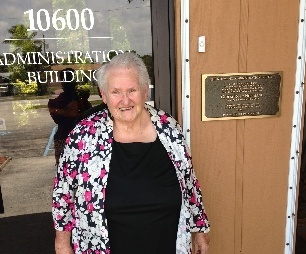 The Memorial Service for Eliza Ruden will be held on Wednesday August 28, 2013 at 10:00 A.M. in the East Ridge Chapel, 19301 SW 87th Avenue. All parishioners from St. Faith’s who knew Eliza and wish to attend are welcome. July 25, 2013 - In honor of over 20 years of dedicated service, the Vestry recently dedicated the Administration Building at St. Faith's as the NORMANN ADMINISTRATION BUILDING. 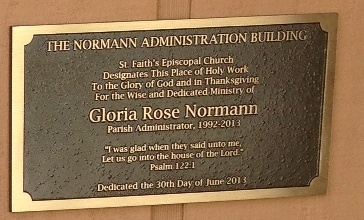 Gloria Normann shown here in front of the new bronze plaque placed to memorialize this dedication. we departed with a spirit of deep gratitude for her ministry and for our life together in Christ. Special Thanks to all who assisted with decorating; organizing and delivering the gifts. What a wonderful day! See SLIDE show Here. Sunday May 19 - Pentecost. St. Faith wore RED as a sign of the fire of the Holy Spirit, making our hearts alive in the Lord. This day is called the Birthday of the Church, and we will celebrate the occasion with balloons and birthday cake. Alleluia! Sunday May 19, we will held the Spring Ingathering of the United Thank Offering. Susan Price will be happy to give you a box or a special envelope so that you will be prepared to make your offerings to this very special fund, which extends our thanks for God’s blessings to those in need of our blessed assistance. Sunday May 12 - Mother's Day: The St Faith men's group led by Barry Bullock, hosted another wonderful breakfast this morning in honor of the mothers among us. Sat May 11, 2013: Marcia Hitchins reports that the Yard Sale was a huge success - with the Food Pantry raising $861 (the cost of running the Pantry for a month). This was raised from not only the sale of spaces, but also from Jeanette Astwood and Laurie Ariza turning over their sales for the day to the Pantry, as well as the DOK/ECW turning over half their sales. Gloria Normann and Barbara Seykora donated $25 each even though they were unable to set up spaces for themselves. The Pantry sincerely thanks to Jim Piersol and Shawn & Andrea Jones for marking out the spaces for the sale, and Shawn and the men's group for being there and helping to break down after. Special thanks to Valrie Gayle and Donna Lewis who who worked tirelessly to help during the sale and all the Bullocks for selling food to raise funds for the Youth. 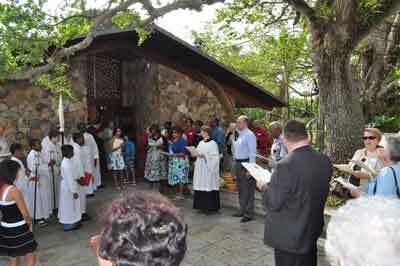 The Parish Annual Meeting was held between services on Sunday, January 8, 2013. We received reports from parish organizations and elected three vestry members, 2 delegates to diocesan convention. Many thanks and gratitude to the 3 retiring Vestry Members who have served the past 3 years: Eileen Alvaranga, who has served as Sr. Warden and worked tirelessly on the Silent Auction; Lawrence Ventura, Jr. who organized the Air Show and Silent Auction events; and Patricia Whipple who organized and nurtured the newcomer and hospitality committees. New Members of the Vestry: Shawn Jones; Valrie Gayle, Dorothy Culmer. 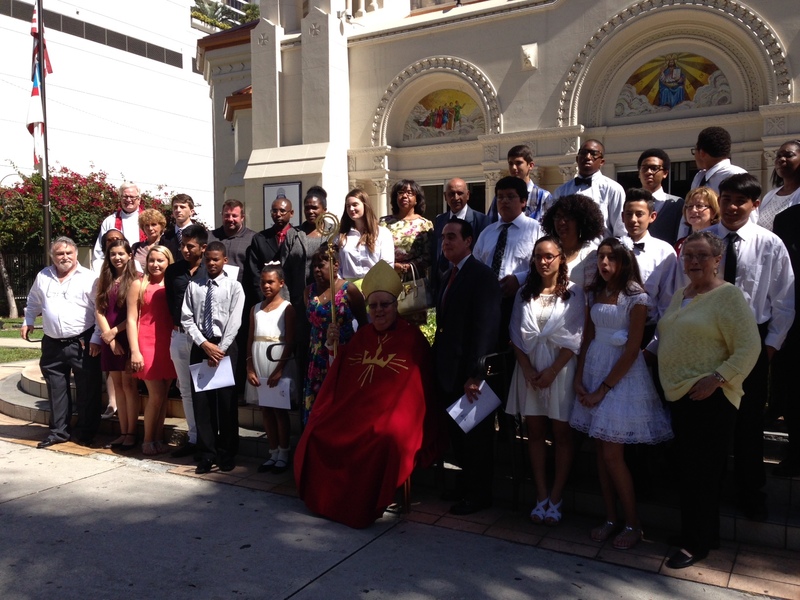 April 27th, 2013 The Diocesan Acolyte Festival was be held at Trinity Cathedral. This is always an exciting occasion for our youth. Sunday January 17: We welcome John Mahannah back on our organ bench supporting our music! We are delighted to enjoy his musical talents and his friendship again on this Sunday. After the service do not miss the chance to greet John in person and share your latest news with each other. 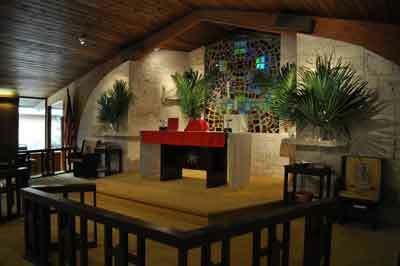 Saturday, January 26, we will gather as a community at 8:15 for our annual Parish Visioning Retreat. We begin with a light breakfast followed by a morning of dreaming and planning for the LIFE of St. Faith’s in 2013 and beyond. Members of all ages can contribute in this process, and we hope YOU will join in. The community planning process ends at 12:15, but the Vestry will meet for lunch afterwards in the Administration Building to reflect on the ideas generated and to handle a few bits of Vestry business. At our annual meeting we elected Tilcia Branch, Jennifer Edwards-Goldsmith, and Tracy Macdonald as new Vestry members, as well as John and Valerie Hrasar as our delegates to Diocesan Convention. We are very grateful for your willingness, even eagerness, to accept these ministries. Thank you also to those whose Vestry terms have just ended: Ann Marie Abell, Jim Piersol, and Susan Price. During his three years Jim served in the capacity of Junior Warden and Senior Warden (though not simultaneously!). St. Faith’s has been blessed with dedicated leaders. 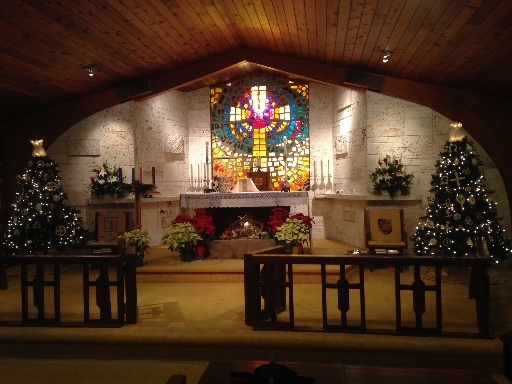 Sunday; January 6, 2013 – St. Faith’s Episcopal Church. Bishop Frade made his official visit to St. Faith’s on the Feast of the Epiphany. We celebrated with The Rt. Rev. Leo Frade, Bishop of Southeast Florida and had a great LUNCH and RECEPTION afterward. Thank you to Barry Bullock, John Hrasar and Marcea Paul who coordinated lavish hospitality, with a festive lunch for Bishop Frade at his official visit on January 6 and with a yummy hot breakfast for our Annual Meeting last week. Thank you for feeding us magnificently! This kitchen crews take on special events on Sundays from time to time. Please speak to Barry if you would like to find out how you can help on the next occasion. St. Faith’s hosted another great fundraiser event this year. Many thanks to the organizing committee, headed by Eileen Alvaranga along with the extraordinary hard work of those who helped with the organization and during the event including Andrea and Ed Frye, Barry, Josh, Miles and Brandon Bullock, Jerri Payne, Gloria Normann, Marcia Hitchins, Dorothy Culmer , Blanche Griffith, Donna Lewis, Marcea Paul, Valrie Gayle, Andrea and Shawn Jones, Marion Chin, Isabel and Tom Graf, Pat and John Robinson, Amera and Allison Jordan and many others. 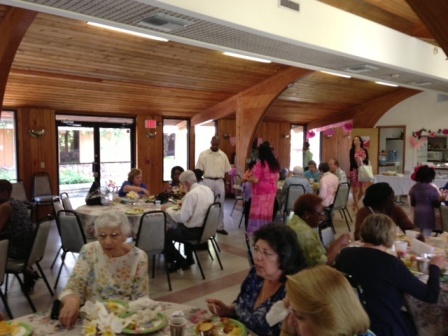 The parish was well represented and we enjoyed the company of our family members and friends. Larry Ventura took on the role of Master of Ceremonies and Auctioneer, cheering the crowd into a bidding frenzy. Items put up for auction included artwork, pictures, objects of silver, crystal, china, jewelry, along with various sports memorabilia, airline tickets, gift certificates to restaurants and various services and several vacation offerings. The bidding was fierce and fun. The food was scrumptious and drinks were incredible. The setting at Palmer Trinity was grand. The final tally is not in yet.... but we defiantly had a great time. A big “thank you” to all who participated and supported our St. Faith family event. 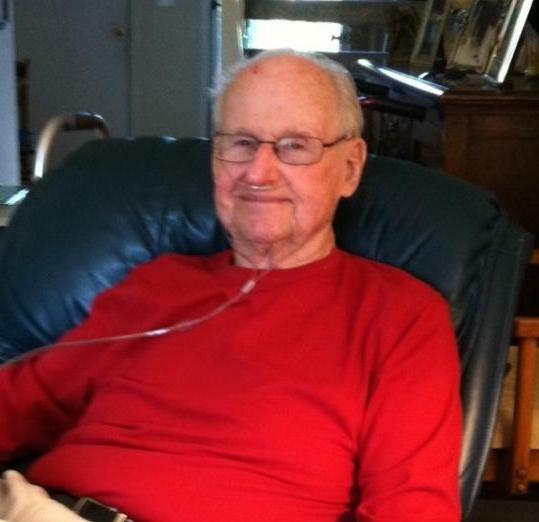 October 14, 2012: We recieved news that Tom Dawson, husband of past long time parishoner Mary Dawson passed away last week. After being active in the life and ministry of St. 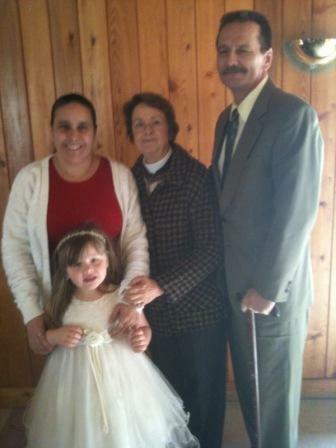 Faith for many, many years, Tom and Mary had moved to Jacksonville early last year to be closer to the grandchildren. Tom was a real estate agent and mortgage broker who helped a number of St. Faith parishoners in their housing needs over the years. 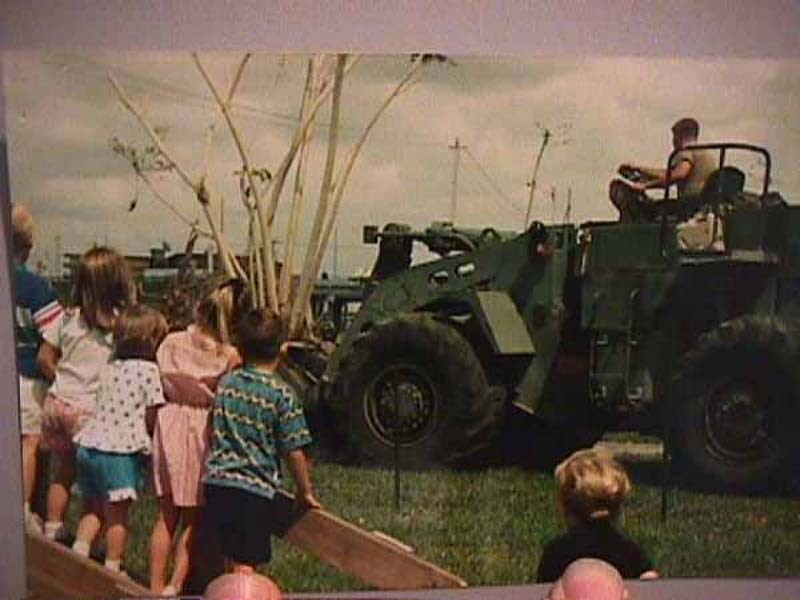 Tom also liked to bring his 40 ft motor home to church everytime the EYC would hold a $5 car wash. We miss you Tom !!. September 24, 2012: Pat Buckland, one of the many early founders of St. Faith Episcopal Church passed away. Pat served St. Faith from the early 1950’s thru 1999, when she and husband, Charles moved North to be with family. Pat served three Rectors of St. Faith including Fr. Wilber, and Fr. Verell. 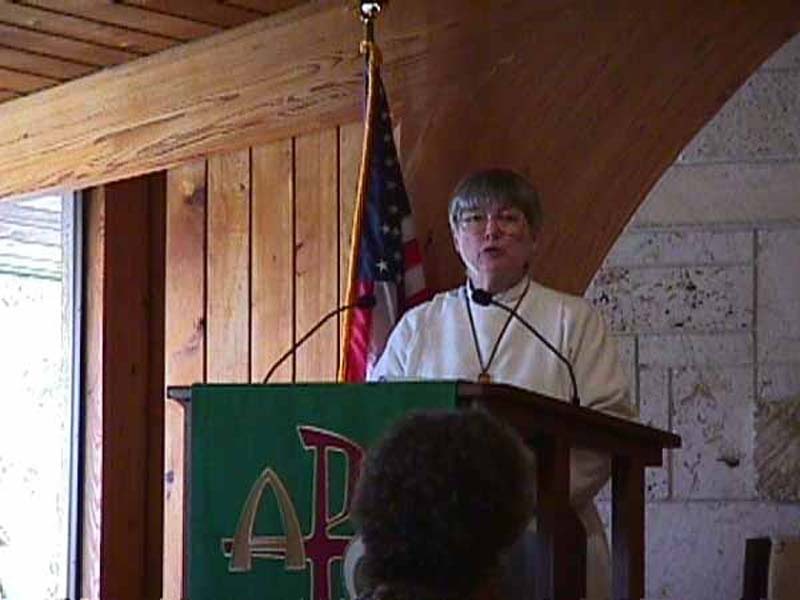 She served in many, many roles including Parish Secretary and of course as THE Director of the Altar Guild. To this day, the influence of Pat’s ministry remains in and around St. Faith’s. 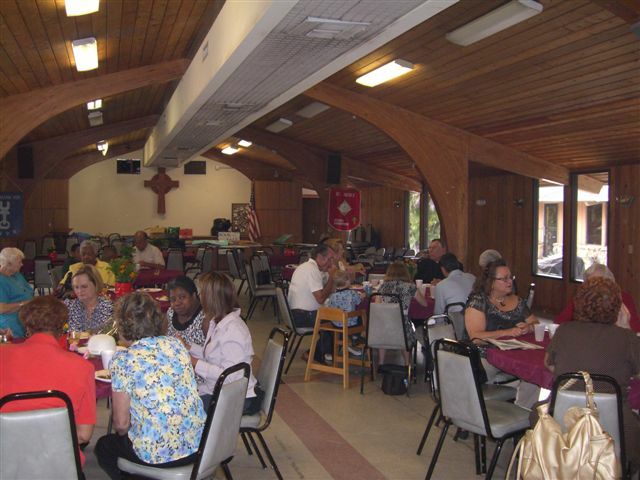 The Parish Hall was decorated with flags and images of countries around the world, and the tables were laden with foods of all flavors and cultures for International Sunday Lunch. St. Faith’s is such a diverse community, that we feel pretty sure almost every country in the world was represented. Then that last Sunday in September, September 30th is when the Stewardship Campaign will kick off. The Vestry, in their next meeting will make plans for the campaign, so listen up and read your bulletins and visit the St. Faith’s website. 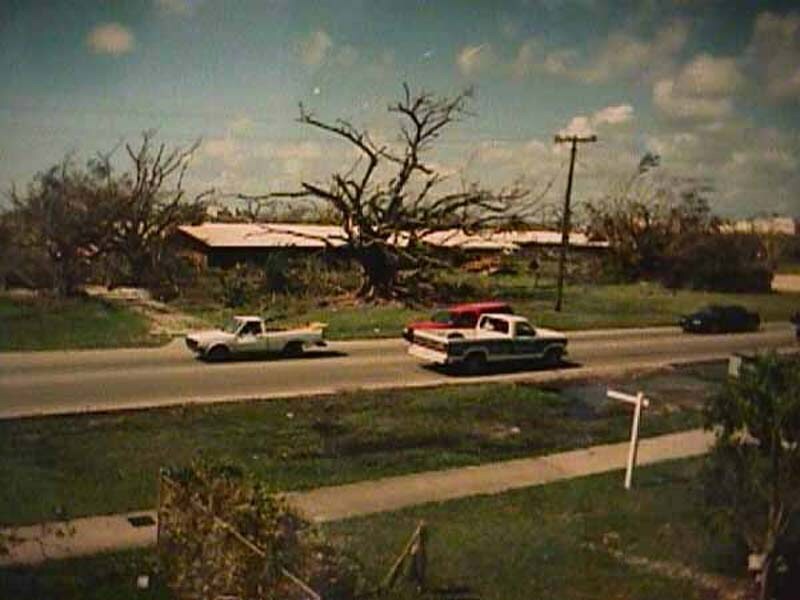 August 26: ... As we awaited the passing of Tropical Storm/Hurricane Isaac; we remember 20 years ago that weekend; 8/24/1992 - Hurricane Andrew. 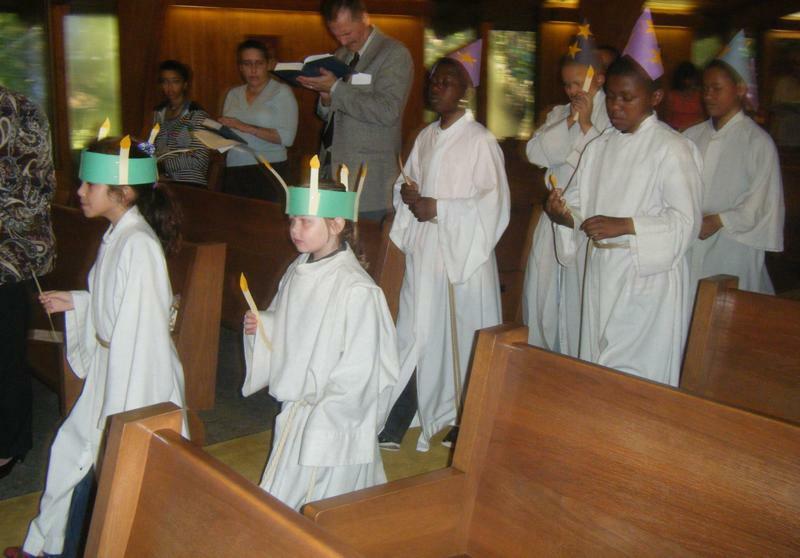 Sunday July 14 2012- Kanuga Campers Lead the Worship Service at St. Faith. 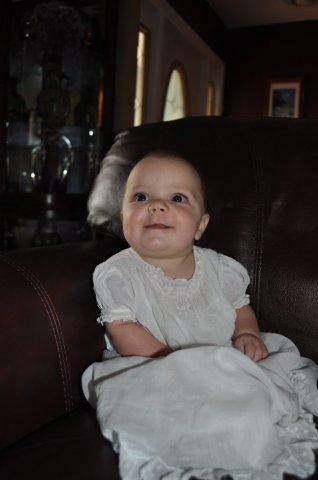 Harper Avery Piersol, daughter of Bryan and Lauren Piersol was Baptized by Fr. Tom Graf on Sunday July 8. This continued the involvement of the Piersol Family in the life of St. Faith’s. The old time parishioners remember so well Walter and Marie Zahn, Harper’s maternal great grandparents. The present day congregation knows how we depend on the ministry of Chris and Jim. We watched Bryan and Lindsay grow up in the parish. Bryan and Lauren have come “home” to have each of their three children Baptized. Sunday July 1, 2012 St. Faith Celebrated July 4 Holiday with a PICNIC in the Parish House this afternoon. Mother Reid was instituted as Rector of St. Faith’s at a fabulous event on April 22. 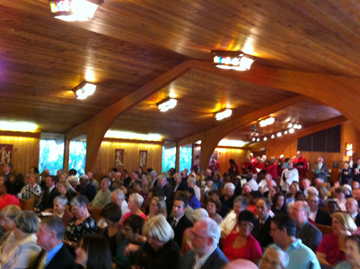 About 250 parishioners, guests, and clergy attended. After the service, a scrumptious dinner was hosted by the Reid's in the Parish House. Photos and slide show will be posted as soon as the photos are available. Thank you to all who worked to put on this event, in particular Gloria who chaired the institution committee and put in many extra hours of work. 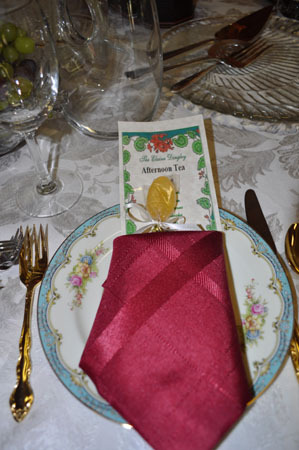 Eileen Alvaranga coordinated the details of the decorations and worked with the Caterer and the rental company for the tent. Many in the parish helped silently, others were more visible. The Altar Guild did lots of extra work to adjust the sanctuary for the event, Dr. Greco and the Choir spent extra hours practicing; Jim Piersol got the school classrooms set up for the temporary clergy vesting area; Dorothy Culmer, Andrea Frye, Valarie Gayle, Isabel Graf, Marcia Hitchins, Donna Lewis, Marcea Paul, Jerri Payne, and Pat Robinson helped with the decorations and set up; John Robinson power washed the area for the outside tables; and Ed Frye met the tent people there on Saturday morning . 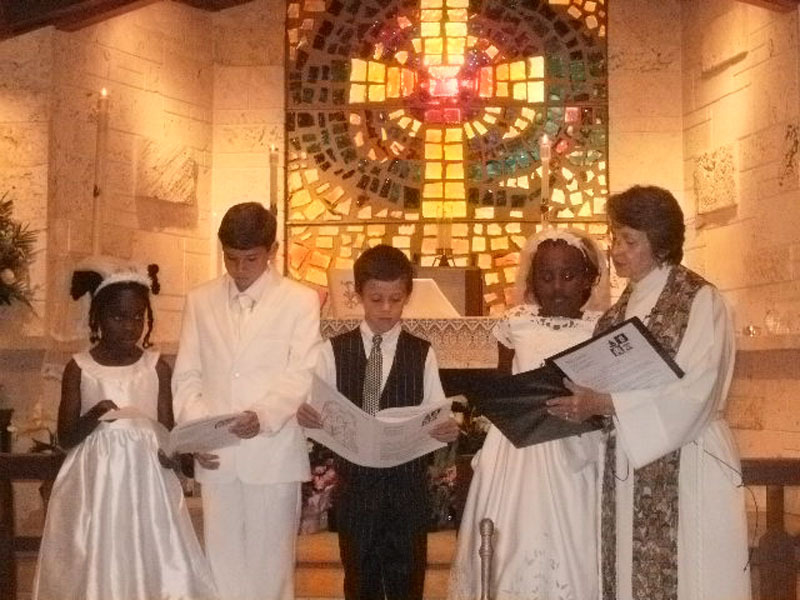 . . . .
Raquel Ortiz sent in a few photos of the Easter Vigil Service which included a Baptism Celebration as well as several First Communions. Anthony Ortiz, and Hope Ann River-Coast were Baptized. Holy Week was a very busy one ... click HERE for a slide show of just a few images; including the annual blooming of the St. Faith Easter Orchid; Palm Sunday; Seder Dinner and Service; Easter Egg Hunt, and of course EASTER SUNDAY SERVICES. Thanks go out to all of you to all who worked and participated to make it all happen, including the Altar Guild, the EYC youth who made palm crosses, and hosted the Easter egg hunt, to those that set up / cooked and cleaned up for the Seder, to those that folded all of the church bulletins, to Gloria for all she does; and all of the parish family for their participation. 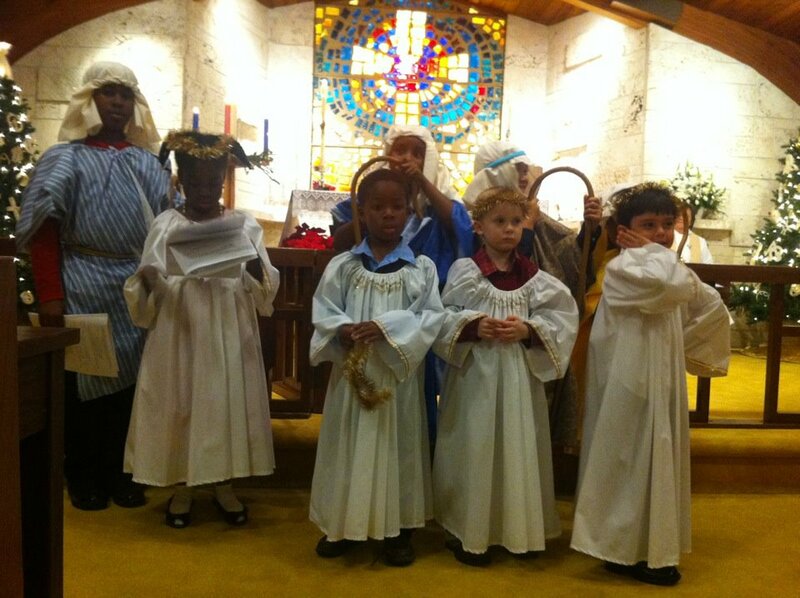 Christmas Eve Family Service - St Faith children's program. 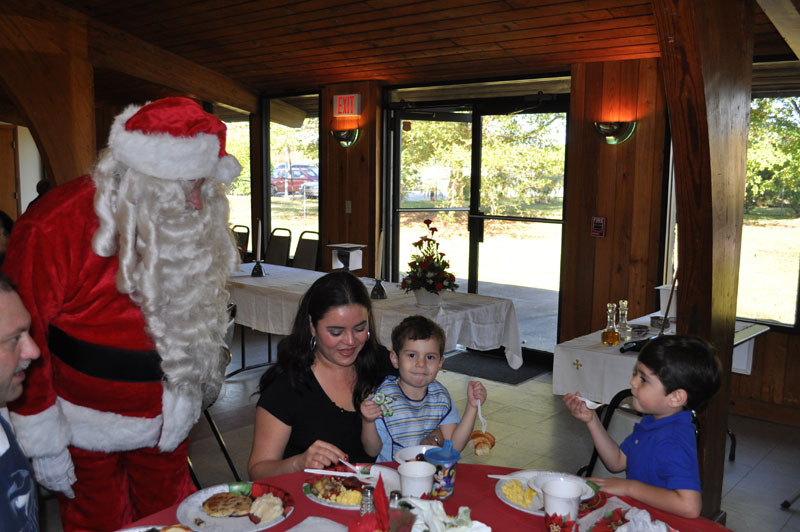 After checking his list, Santa found that he had some time to visit at St. Faith’s, for Breakfast on Sunday December 18 at 9 a.m. He joined us that morning for Breakfast, and the Family Service that followed. Thank you to Barry Bullock and his helpers for another fantastic St. Faith Breakfast. On Wed December 12 our children meet for breakfast at 8.30 and a singing warm up before departing to sing at our Holy Eucharist at East Ridge Village Chapel. The Snowman Project was a tremendous success thanks to everyone at St. Faith’s who took the time to buy a gift. If you could see the faces on the parents of children who received those gifts ear-marked for the Food Pantry, you would understand what a great thing you did. Approximately 60 gifts from St. Faith’s were given out, among them being a bicycle donated by one of our parishioners. Gifts were also received from our friends from St. Thomas Episcopal Church – so most everyone from the Food Pantry was able to receive gifts for their children and grand children. 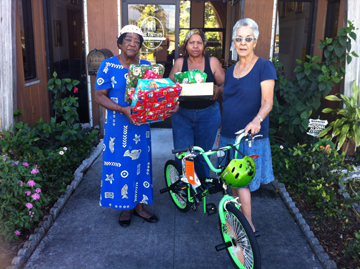 The recipient of the bicycle was the grandson of one the Pantry’s longest registered clients. To say she was thankful would be an understatement. 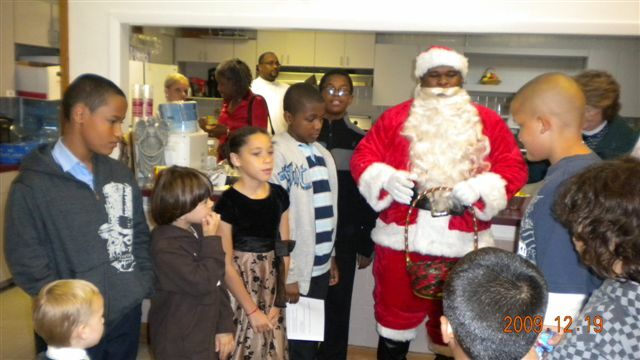 Other gifts were taken to Safe Space, so those children there, could also enjoy Christmas. Thanks everyone. Generous donations were also received for the Food Pantry from our parishioners, to buy hams, for our clients. Every client that came into the Pantry during the last two weeks of December was able to receive a small ham. It was a treat for them. The Reids’ Peek-at-Christmas Open House- Many of us gathered on December 11 – at Ben and Jennie Lou's for their annual open house. A great time was had by all. 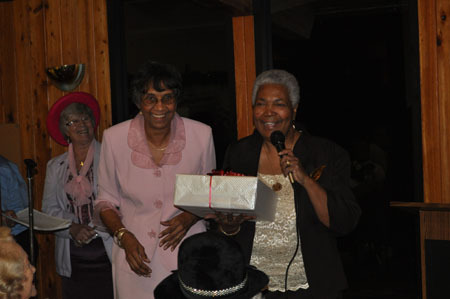 At the November meeting the Daughters of the King elected their officers for 2012/2013. They are: President – Valerie Hrasar; Vice President – Tilcia Branch; Secretary, Patricia Whipple; Treasurer, Susan Price. 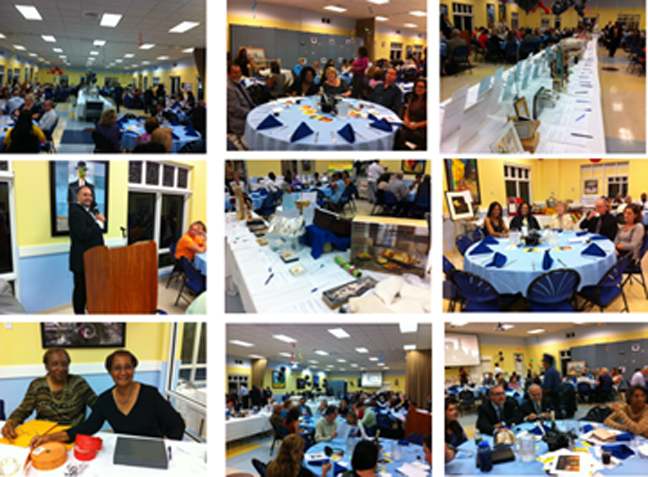 A slide show of photos from the Saint Faiths Silent Auction 2011 are posted here. July 16 2011: The "Paint Party" was a huge success. Jim Piersol, Jr. Warden who organized it says THANK YOU / THANK YOU ... to the 20+ folks who showed up to help. We finished painting the exterior of the Church / Parish Hall/ and Administration Building .. 20+ gallons of paint were applied... (most of it made it onto the Buildings). We had painters of all ages and levels of experience. The experienced crew (who started this project last April) were Jim Piersol / Evan Alvaranga / and John Robinson. They were assisted this time by Barry Bullock / Josh Bullock / Myles Bullock / Kyle Connell / Dashia Freeman / Dede Freeman / James Freeman / Jamie Freeman / Thomas Graf / John Hrasar / Cameron MacDonald / Tracey MacDonald / Kyle McKinney / Mrs. McKinnon / Marcea Paul / Ashley Scott / Larry Ventura. Mother Reid treated everyone to Pizza after a few hours of sweat. Mother's Day was celebrated at St. Faith Sunday May 5. 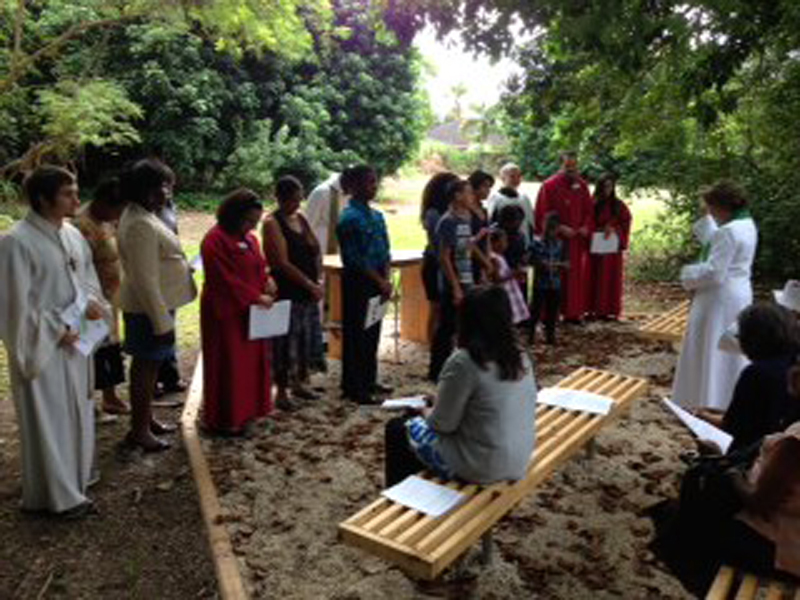 The Mothers were honored during the service and at the 9 AM Breakfast. 25+ Volunteers from St. 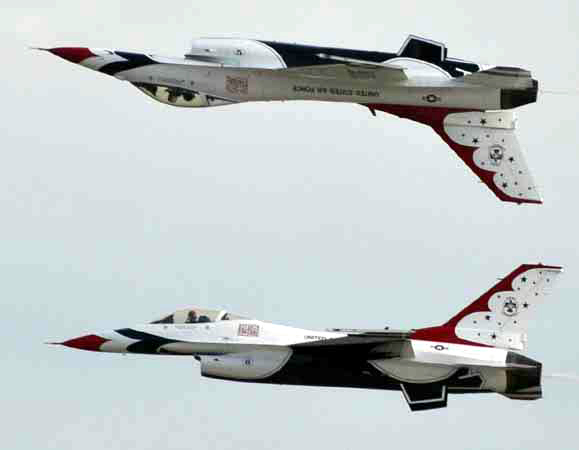 Faith cooked; and provided 2000+ meals at the Homestead Airshow Saturday and Sunday.... Hamburgers and Chicken Fingers were our 'thing' .... Wonderful weather; lots of fun; all were tired at the end of the day.... $2000 was raised for St. Faith. 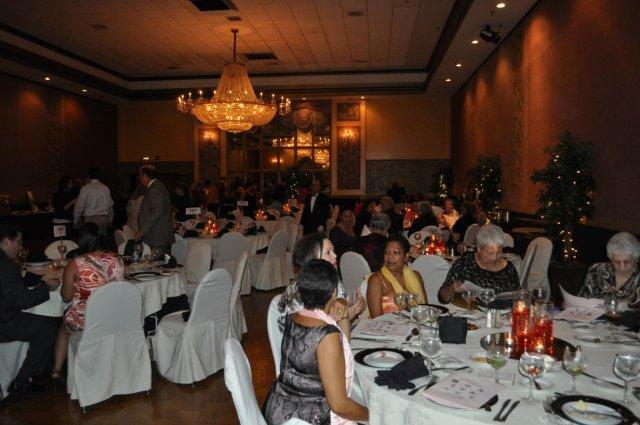 Our dinner and silent auction took place on October 8th 2010 at Signature Gardens. We had over 95 in attendance, and the bidding was fierce and competitive as Master of Ceremonies, Larry Ventura drove the bidding higher and higher. The event raised over $7,000 which will help with our Parish outreach including funding for our Food Pantry. Raffle tickets were sold for a series of door prizes and grand prize of 2 airline tickets was won by Agnes Alexander, congratulations!!. The crowd placed bids on over 80 various items that had been donated. The items ranged from Art Work, to Restaurant Gift Certificates, to Vacations in North Carolina/and the Keys, to football games and other sports memorabilia. A GREAT time was had by all. 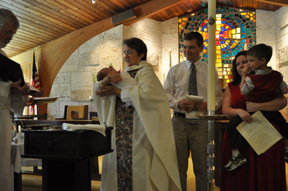 Caden Austin Piersol , received the Sacrament of Holy Baptism on August 22 2010 at the 10 am service. Sunday July 25 2010 was a sad day for St. Faith’s because we must say goodbye to Stephen and Christopher Branch. They are moving to Georgia. We will miss them and wish them happiness as they settle in to their new home. A reception was held in their honor. Sunday July 4 2010 was celebrated with an Independence Day Picnic. Tons of food and good cheer were enjoyed by all. A slide show of the festivities is HERE. CONFIRMATION SUNDAY Demi Carlin, Luz M. Espona-Iturbe and James Jeffery Seale were presented for confirmation and Ann Abell and Benita Alexis reaffirmed their baptismal vows at the Confirmation Service June 13, 2010. 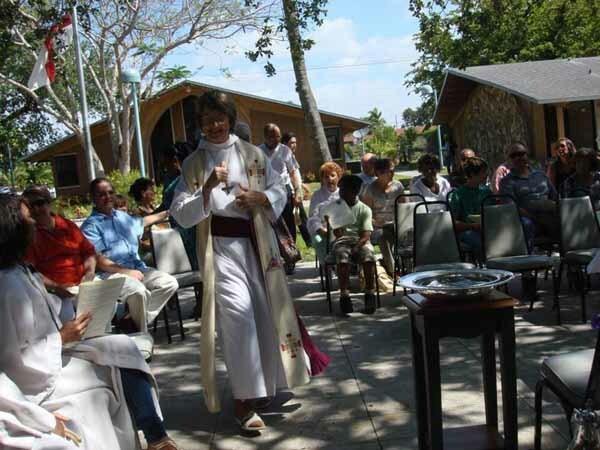 Bishop Leo Frade presided together with Rev. Jennie Lou Reid and Rev. Cyril E. White. 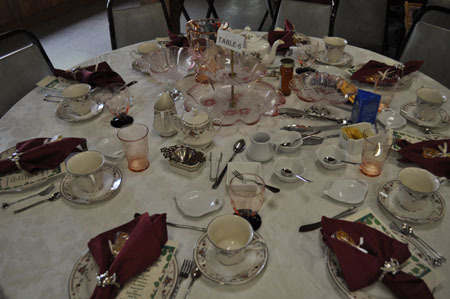 After the service the parish hosted a feast in the parish hall. The men had roasted a pig and a turkey, and the women had provided the side dishes and deserts. Thanks to John Hrasar for organizing this event that included the hard work of Barry Bullock, Lawrence Ventura, John Robinson, Ed Frye, John Monteleone and others. They started cooking at 4:30 AM in order to be prepared for the crowds... and pressure cleaned the patio by 7:00 AM just to kill time. On Saturday May 1st, 2010 our brother Tom Johnson (seen here with wife Laverne) was honored by St. Faith’s and the Cursillo and Kairos ministries, at an Ultreya. What’s that you say? Well an Ultreya (which means “Onward” in Spanish) is a meeting of people who have shared the Cursillo experience. They meet to share their life experiences based on the tenets of Cursillo life, and no one exemplifies this more than Tom Johnson. The theme of this Ultreya was “Planting the Seed”. . Special thanks to Valerie Hrasar for her hard work in organizing this happy (surprise) event. 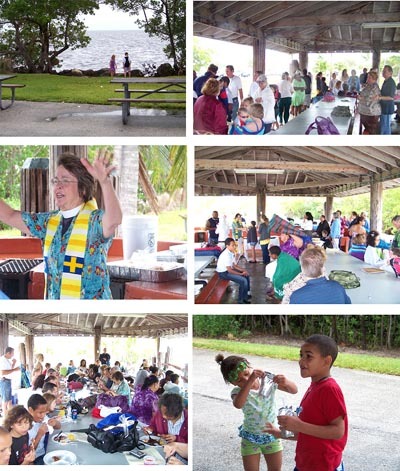 Church on the Beach” Sunday, April 18, 2010 - was a success ... even with the 'light' rain... about 60 attended our Worship and Picnic at Homestead Bayfront Park. Thank you to ALL who made the extra effort. There was a light rain; and some 'cool' breezes ... but inspiration and fun was had by all. We met under the shelter, and gathered for services. John and the Choir provided music using the portable keyboard. 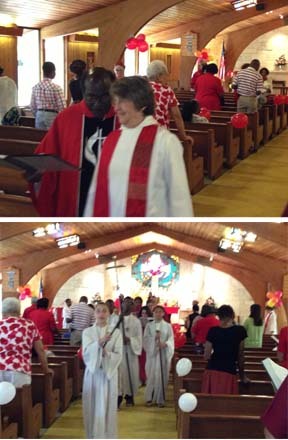 Mother Reid led the service, the Youth provided interpretive readings; and we concluded with Holy Communion. Then we feasted on BBQ from Shorty's; and the kids played. A few hearty young ones even went swimming. 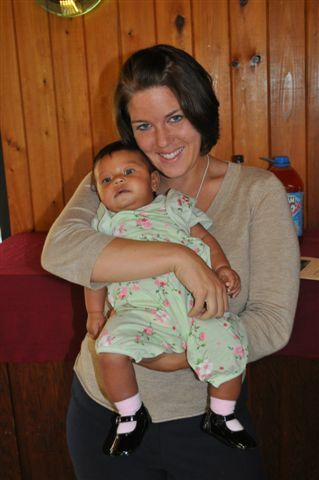 Nicole Rylee Carlin , received the Sacrament of new birth on January 10 at the 10 am service. St. Faith had breakfast with Santa on Sunday December 20 2009. Our chef of the day was Barry Bullock – so in addition to meeting and greeting Santa we were “feasted” by Barry and his band of helpers. A family friendly Holy Eucharist followed the breakfast. Open House - Ben and (Mother) Jennie Lou Reid: Everyone gathered for a wonderful evening of conversation, great food and drinks Sunday December 13 2009. St. Lucia's Visit: Sunday December 13 2009 during the ten o’clock service we were visited by St. Lucia in accordance with the tradition of Sweden. 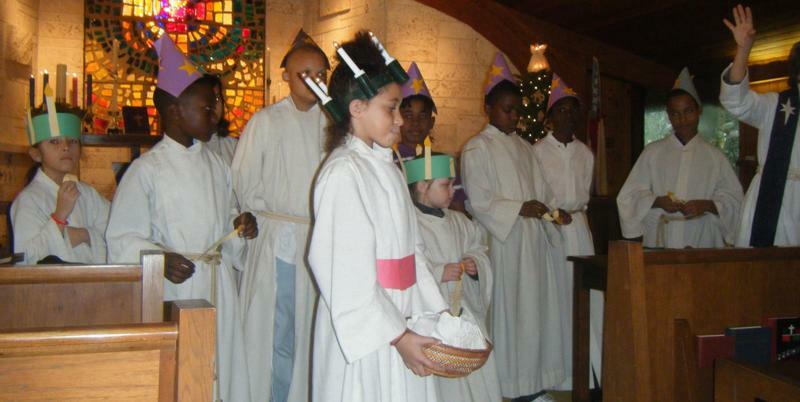 Each year on December 13, Saint Lucia is celebrated widely with candlelight and traditional candle-lit processions. Lucia herself was Christian and died for her faith. The December 13 holiday honors her. First Time since Hurricane Andrew. About 25 hearty souls from St. Faith volunteered at a food concession at the Homestead Air Show. Organized as a fundraiser activity our booth was front and center/ right on the flight line with a front row seat to all of the activity. [Thanks to Larry Ventura]. The event drew 80,000+ spectators on Saturday and again on Sunday. We never imagined so many 'hungry" people. Bishop Schofield even stopped by for a bite (twice). The food preparation and distribution was non-stop from 9:00am until 5:00 pm. 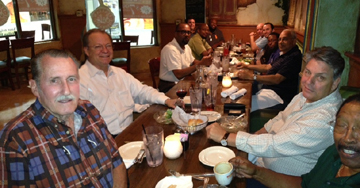 At the end of the day we were exhausted, but it was a really great time and great fellowship .. They raised the roof with glorious sound. If you weren’t here on Saturday, the 18th, for the Third Festival of Music Concert Series you missed something special. The two hours flew by and left everyone wishing it would go on for another hour. 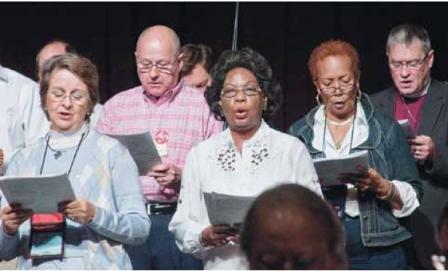 Norma Darby, John Mahannah and our own St. Faith’s Choir, were joined by the choir of the Church of the Ascension, the Jamaica Folk Review and soloists (not in choir presentations) Evan Bascombe, Kay Price, Jean Quinn, and Noel Heron. Kris Nicholson offered music on the piano. Nothing can describe the emotional experience of seeing 150 people, joining hands, and singing “Let there be peace on earth.” It brought tears to many eyes. Hats off to Norma Darby for organizing this inspiring event. 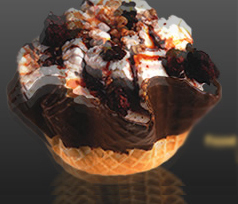 ICE CREAM SOCIAL: was held at St. Faith’s on Sunday, July 5th 2009. Worship at 10:00 was followed by an old fashioned “American” Ice Cream Social. There were games and a drawing for discount coupons to the Golden Corral restaurant. We extend our thanks to those who made it happen – Marcia Paul, Tracey MacDonald, Valerie Hrasar and Carol Bertoli, and, or course, all those who contributed food. About 130 of us met at Signature Gardens for a wonderful meal; and Silent Auction Event Friday June 12, 2009. The event was a tremendous success. We had an enchanted evening of conversation and a great time bidding against each other for the various items up for auction. The event raised a profit in excess of $6,400! ! Our Rummage Sale was a great success. June Bullock did a fantastic job of organizing and the people from the parish worked really hard preparing for the day and spending their Saturday selling. The results are amazing. We raised $1501.15. All goods that were left were donated to the Coalition for the Homeless in Homestead. The Mother's of St. Faith Episcopal Church were honored with a breakfast. Once more we thank Barry Bullock, Val Darby and their band of merry helpers for their culinary expertise. 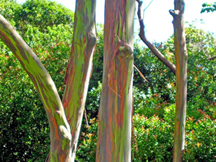 A Rainbow Eucalyptus which on display in only two other places in Miami was planted by Robert Hatos and Ed Frye on Earth Day Saturday. It is planted at the far WEST end of our parking lot - near the exit ramp from the turnpike. This is a very fast growing tree, and should be providing us with additional shade and beauty very quickly. Mr. Robert Hatos has surprised us again by donating a second rainbow eucaluptus tree. It isn’t just the donation of a tree but he, along with Ed Frye, has planted it too. Three new bushes were planted on the south side of the church patio out side the sanctuary. They were contributed by Carol Bertoli in honor of her mother Mildred Smith and by Carol Milner in honor of her grandmother. 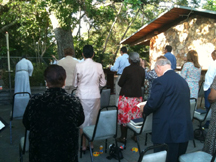 Services were held outside on our patio, under the oak tree. Sermon was by Tom Graf. After Services at 10, we had a BBQ of hamburgers, hotdogs, and lots of other side dishes.